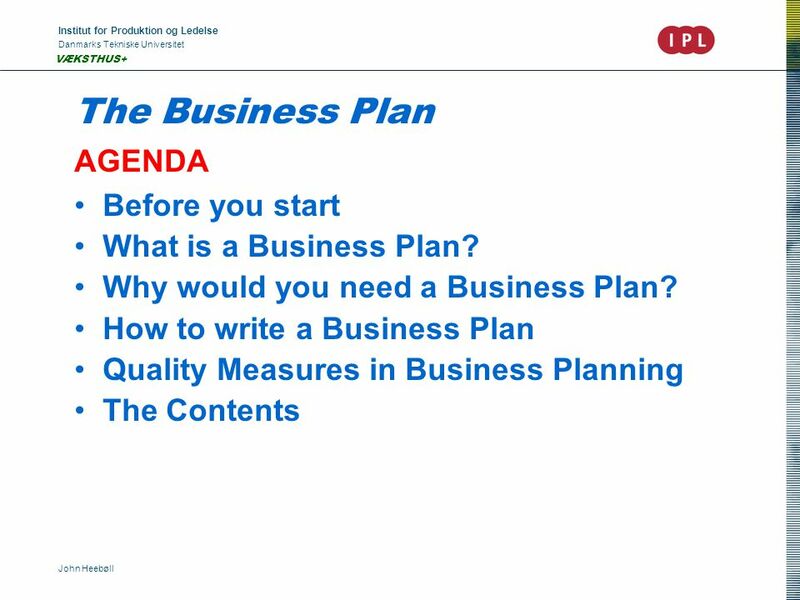 Institut for Produktion og Ledelse Danmarks Tekniske Universitet John Heebøll VÆKSTHUS+ The Business Plan AGENDA Before you start What is a Business Plan? 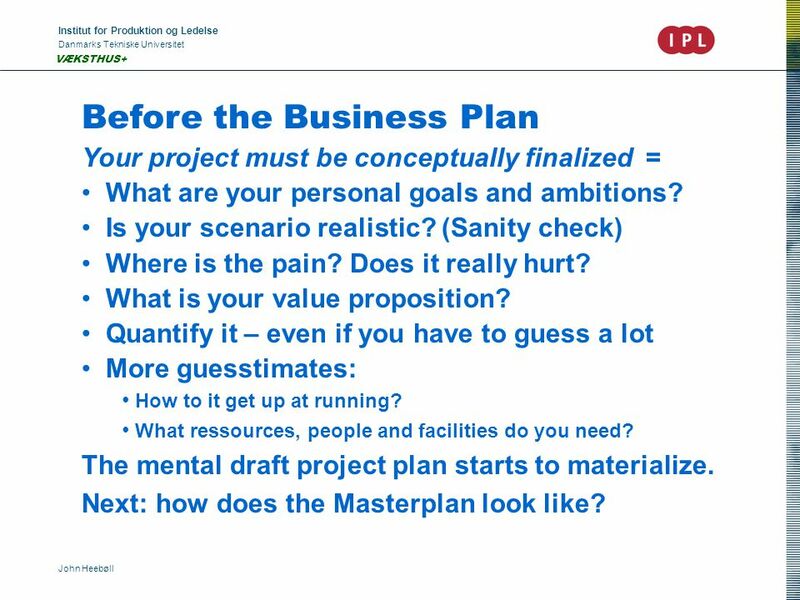 2 Institut for Produktion og Ledelse Danmarks Tekniske Universitet John Heebøll VÆKSTHUS+ Before the Business Plan Your project must be conceptually finalized = What are your personal goals and ambitions? Is your scenario realistic? (Sanity check) Where is the pain? Does it really hurt? What is your value proposition? Quantify it – even if you have to guess a lot More guesstimates: How to it get up at running? What ressources, people and facilities do you need? The mental draft project plan starts to materialize. Next: how does the Masterplan look like? 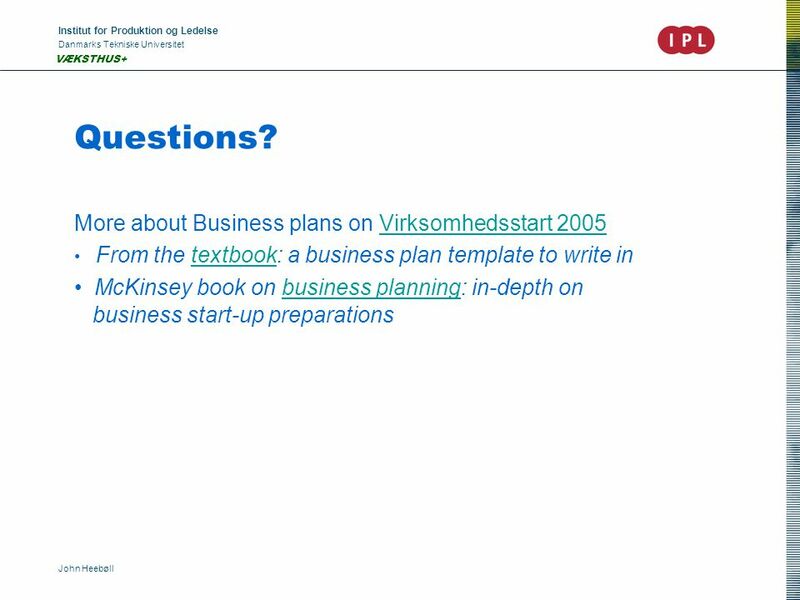 4 Institut for Produktion og Ledelse Danmarks Tekniske Universitet John Heebøll VÆKSTHUS+ What is a Business Plan? 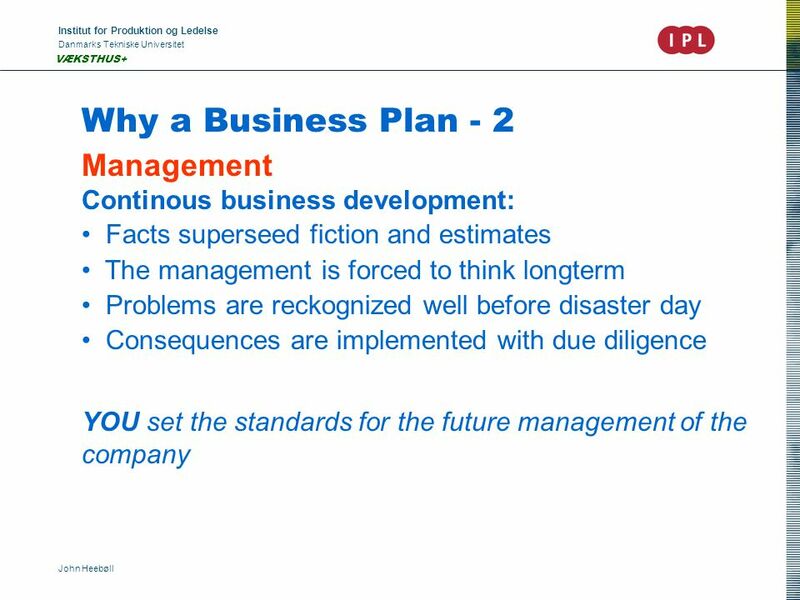 Two things: 1.The detailed rationale behind your business 2.The project plan for the business start-up Ad 1 : Information, analysis and conclusions to support the assumption that this can be achieved, and that the business model is applicable and realistic Ad 2: There is a goal – and it is specific There is a process described by Actions to conclude Ressources involved There is a time table with some milestones There is a budget with a cashflow projection 1+2: there is a business opportunity, and this is how we will exploit it. 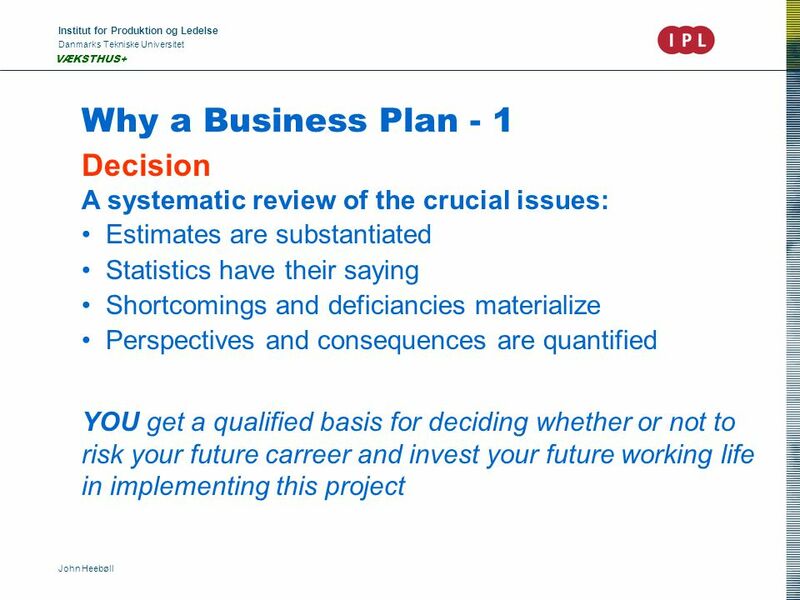 7 Institut for Produktion og Ledelse Danmarks Tekniske Universitet John Heebøll VÆKSTHUS+ Why a Business Plan - 3 Funding How much capital do you need – and for what? Your investors’ incentives? Please explain. YOUR INVESTORS get a qualified picture of the project, the team, the perspectives, the risks and the gain. 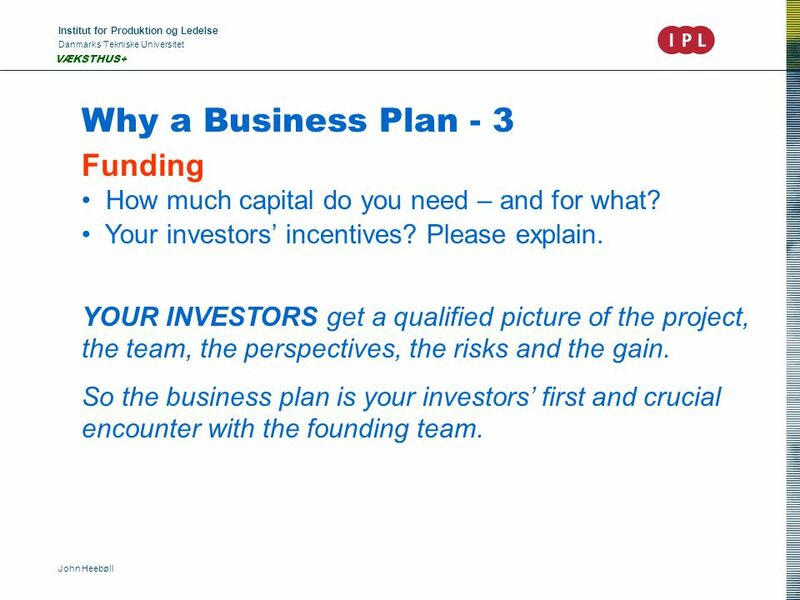 So the business plan is your investors’ first and crucial encounter with the founding team. 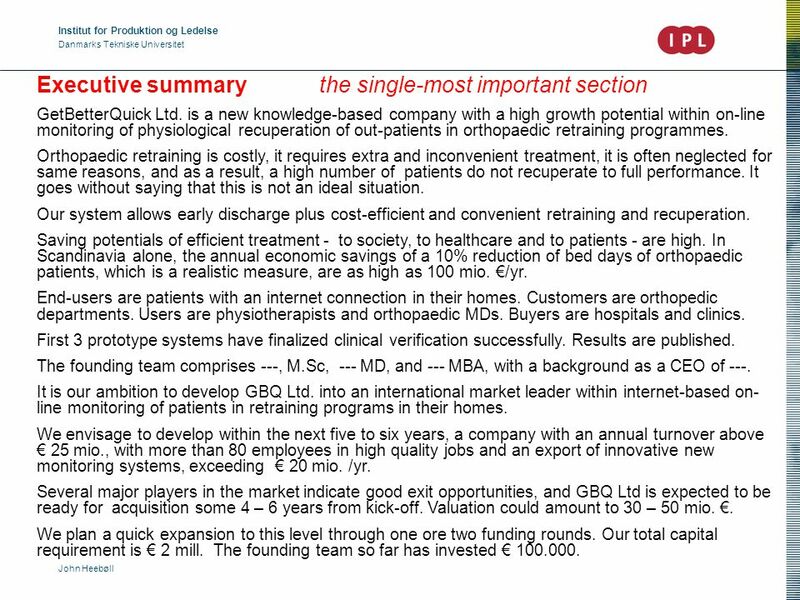 12 Institut for Produktion og Ledelse Danmarks Tekniske Universitet John Heebøll Executive summary the single-most important section GetBetterQuick Ltd. is a new knowledge-based company with a high growth potential within on-line monitoring of physiological recuperation of out-patients in orthopaedic retraining programmes. Orthopaedic retraining is costly, it requires extra and inconvenient treatment, it is often neglected for same reasons, and as a result, a high number of patients do not recuperate to full performance. It goes without saying that this is not an ideal situation. Our system allows early discharge plus cost-efficient and convenient retraining and recuperation. Saving potentials of efficient treatment - to society, to healthcare and to patients - are high. 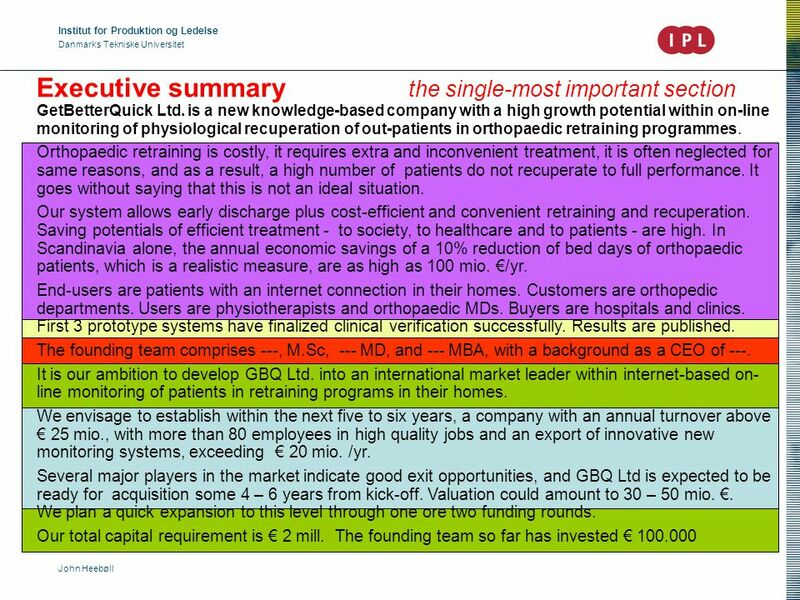 In Scandinavia alone, the annual economic savings of a 10% reduction of bed days of orthopaedic patients, which is a realistic measure, are as high as 100 mio. €/yr. End-users are patients with an internet connection in their homes. Customers are orthopedic departments. Users are physiotherapists and orthopaedic MDs. Buyers are hospitals and clinics. First 3 prototype systems have finalized clinical verification successfully. Results are published. The founding team comprises ---, M.Sc, --- MD, and --- MBA, with a background as a CEO of ---. It is our ambition to develop GBQ Ltd. into an international market leader within internet-based on- line monitoring of patients in retraining programs in their homes. We envisage to develop within the next five to six years, a company with an annual turnover above € 25 mio., with more than 80 employees in high quality jobs and an export of innovative new monitoring systems, exceeding € 20 mio. /yr. Several major players in the market indicate good exit opportunities, and GBQ Ltd is expected to be ready for acquisition some 4 – 6 years from kick-off. Valuation could amount to 30 – 50 mio. €. We plan a quick expansion to this level through one ore two funding rounds. Our total capital requirement is € 2 mill. The founding team so far has invested € 100.000. 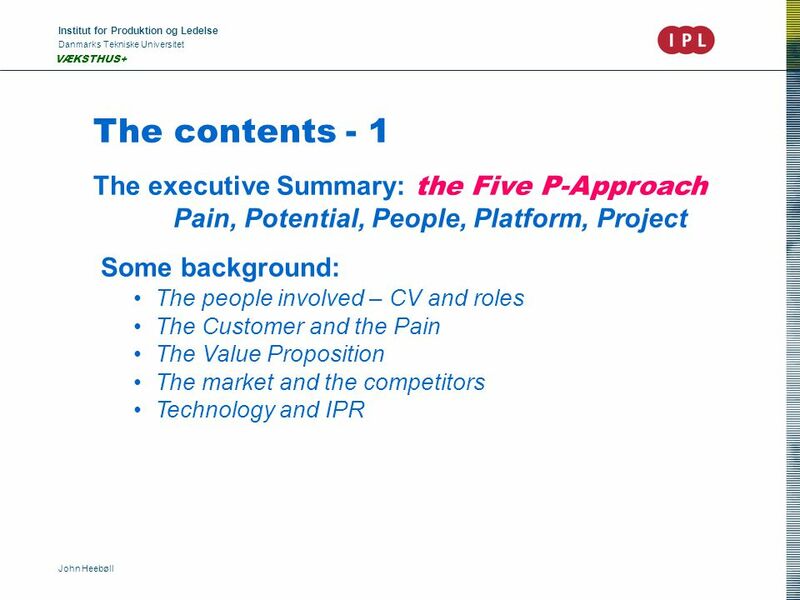 14 Institut for Produktion og Ledelse Danmarks Tekniske Universitet John Heebøll VÆKSTHUS+ The contents - 2 Market Research and - Analysis: Customers in numbers, types, geography, etc. 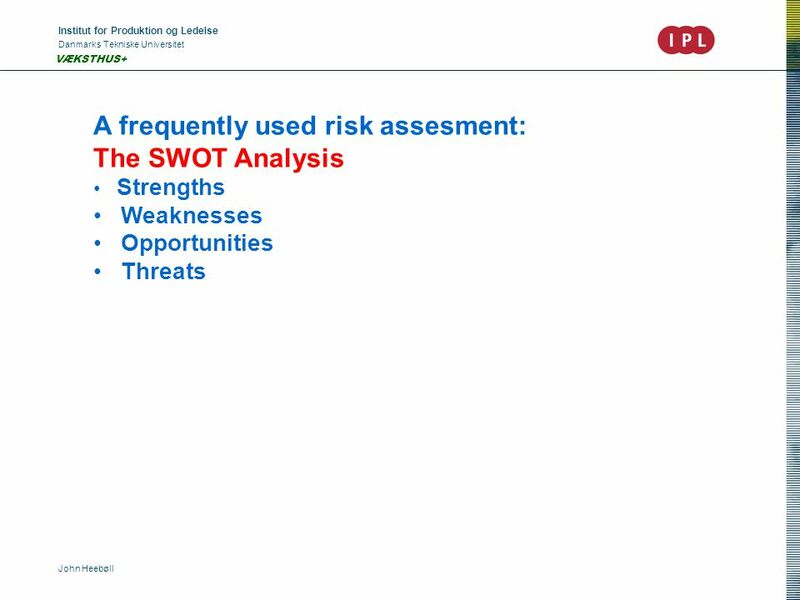 Competitors in types, advantages and weaknesses Market analysis f.x. acc. to Michael Porter Entry barriers (technical, legal, etc.) Technology: How does it work? Why is it superior? 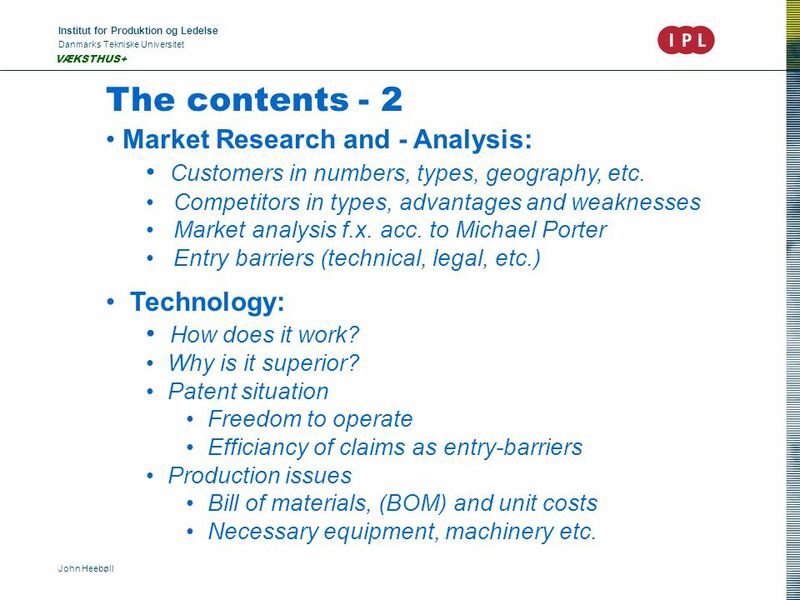 Patent situation Freedom to operate Efficiancy of claims as entry-barriers Production issues Bill of materials, (BOM) and unit costs Necessary equipment, machinery etc. 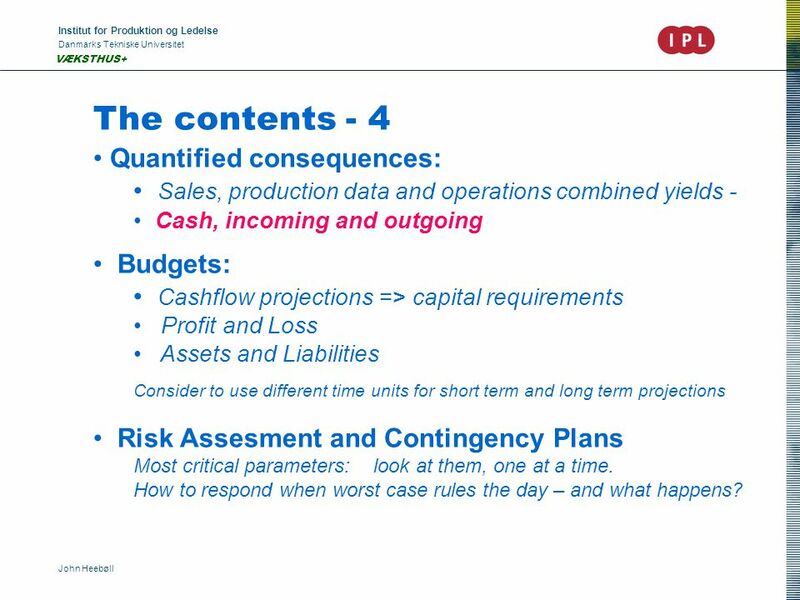 16 Institut for Produktion og Ledelse Danmarks Tekniske Universitet John Heebøll VÆKSTHUS+ The contents - 4 Quantified consequences: Sales, production data and operations combined yields - Cash, incoming and outgoing Budgets: Cashflow projections => capital requirements Profit and Loss Assets and Liabilities Consider to use different time units for short term and long term projections Risk Assesment and Contingency Plans Most critical parameters: look at them, one at a time. How to respond when worst case rules the day – and what happens? 18 Institut for Produktion og Ledelse Danmarks Tekniske Universitet John Heebøll VÆKSTHUS+ The Format All essential information delivered in first 5 pages Max 25 pages alltogether excl. 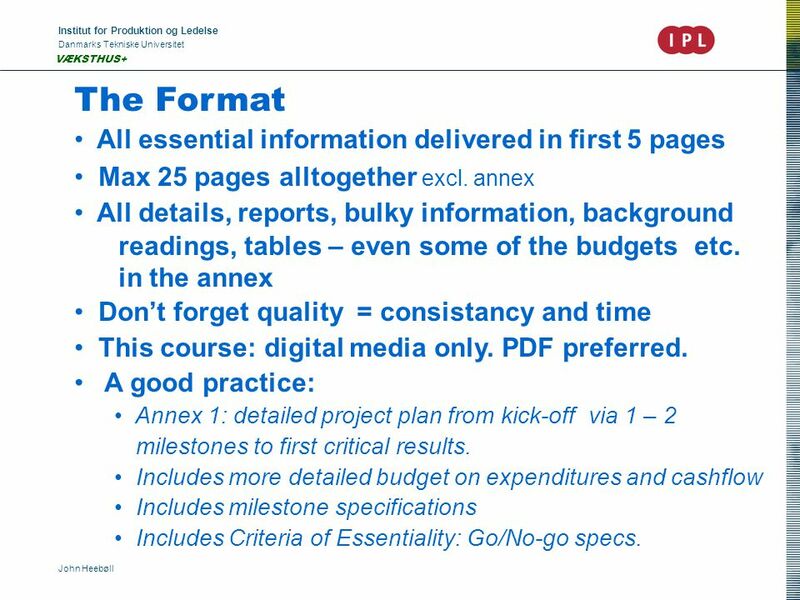 annex All details, reports, bulky information, background readings, tables – even some of the budgets etc. in the annex Don’t forget quality = consistancy and time This course: digital media only. PDF preferred. 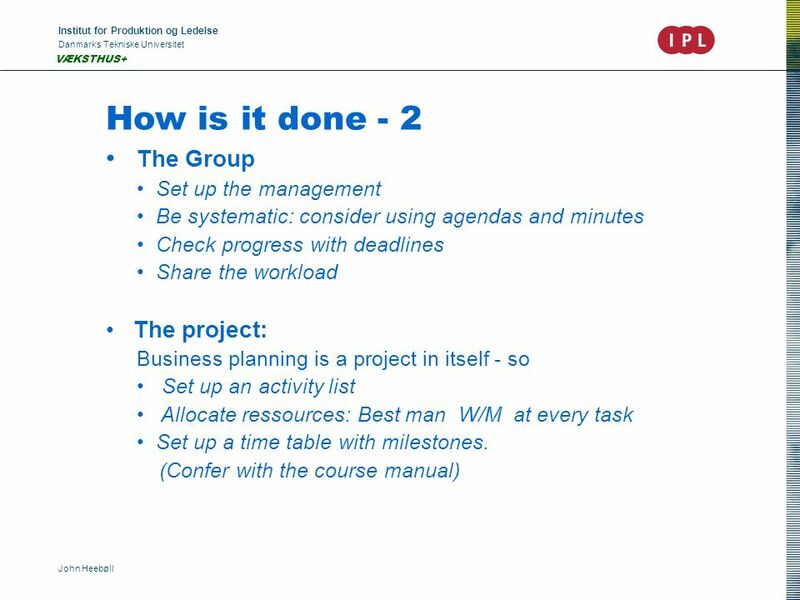 A good practice: Annex 1: detailed project plan from kick-off via 1 – 2 milestones to first critical results. Includes more detailed budget on expenditures and cashflow Includes milestone specifications Includes Criteria of Essentiality: Go/No-go specs. 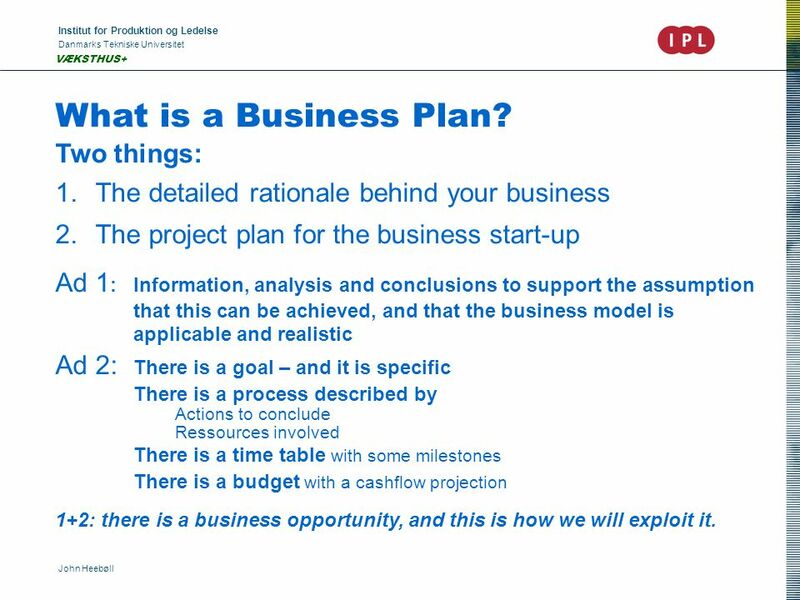 Download ppt "Institut for Produktion og Ledelse Danmarks Tekniske Universitet John Heebøll VÆKSTHUS+ The Business Plan AGENDA Before you start What is a Business Plan?" Institut for Produktion og Ledelse Danmarks Tekniske Universitet John Heebøll VÆKSTHUS+ AGENDA, Thursday, 26 October 2006 Meet Your Assistant Teachers. Institut for Produktion og Ledelse Danmarks Tekniske Universitet John Heebøll VÆKSTHUS+ AGENDA, Tuesday, 8 January 2008 Financing Technology Ventures. Institut for Produktion og Ledelse Danmarks Tekniske Universitet John Heebøll Greenhouse+ Intellectual Property Agenda: Intellectual Property Law: the. 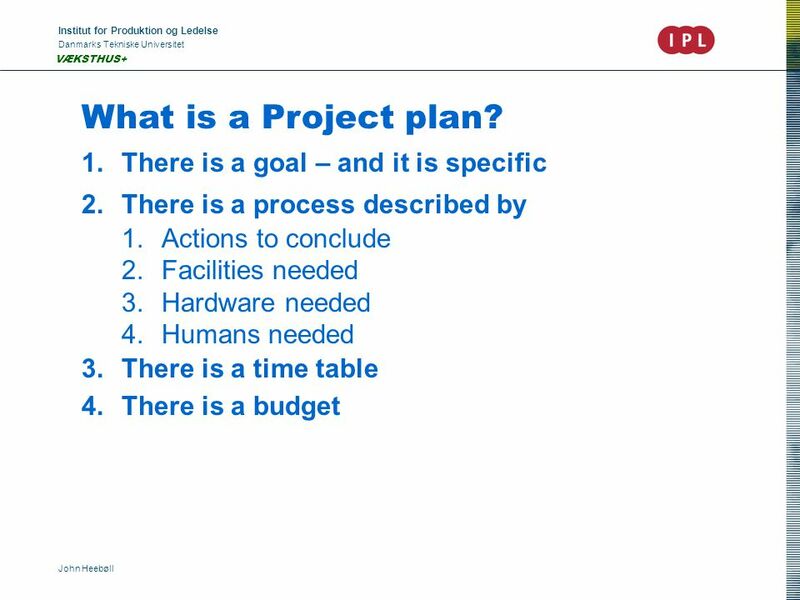 Institut for Produktion og Ledelse Danmarks Tekniske Universitet John Heebøll Greenhouse+ EXAMS Time – and - Place What to submit – and when Evaluation. Institut for Produktion og Ledelse Danmarks Tekniske Universitet John Heebøll Greenhouse+ Sales and Marketing AGENDA Pre-sales Checklist Pricing Unique. 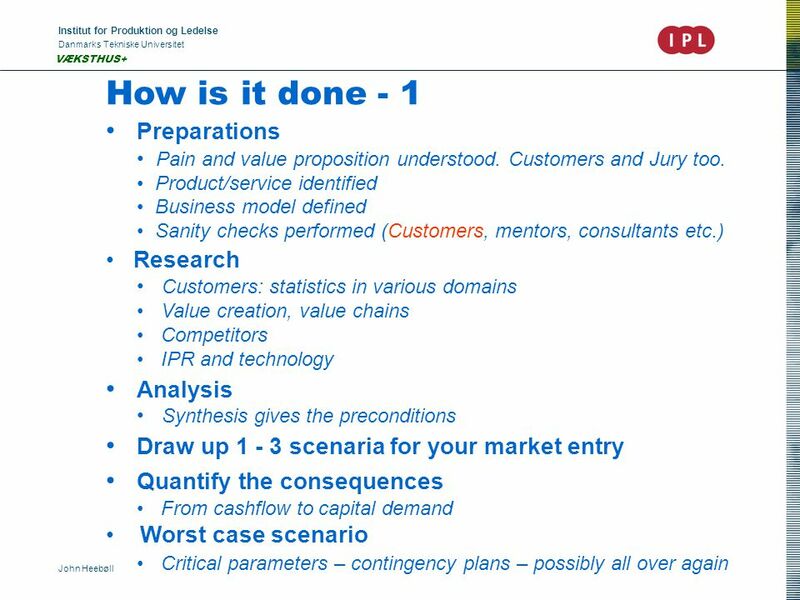 Institut for Produktion og Ledelse Danmarks Tekniske Universitet John Heebøll BUDGETTING a Start-up Types: 3 main + subsidiaries Methodology Case Why bother. Institut for Produktion og Ledelse Danmarks Tekniske Universitet John Heebøll VÆKSTHUS+ Applied High-tech Venturing Agenda The Entrepreneur Motivation. Institut for Produktion og Ledelse Danmarks Tekniske Universitet John Heebøll VÆKSTHUS in a Retrospective. 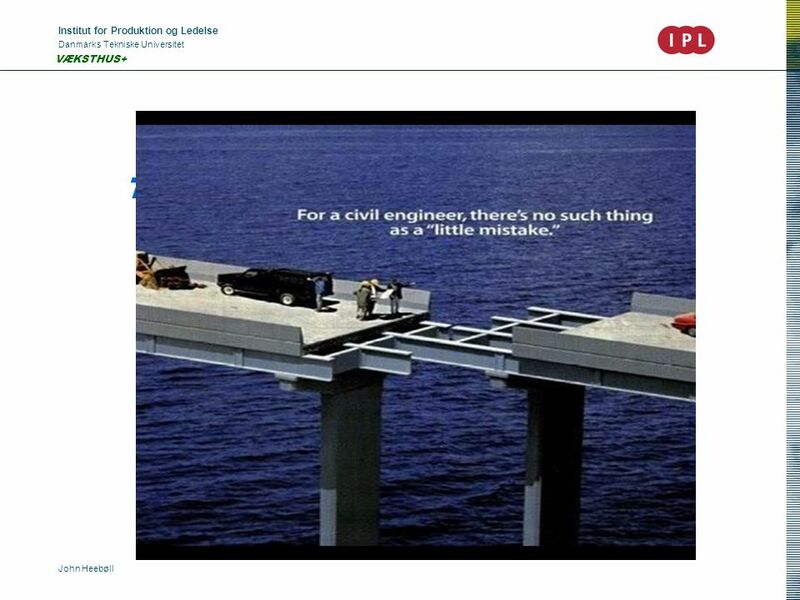 Institut for Produktion og Ledelse Danmarks Tekniske Universitet John Heebøll Business Management R & D Shareholders Board Director Sales & Marketing Production. Institut for Produktion og Ledelse Danmarks Tekniske Universitet John Heebøll VÆKSTHUS+ Wellcome to COURSE Knowledgebased Entrepreneurship 2006. 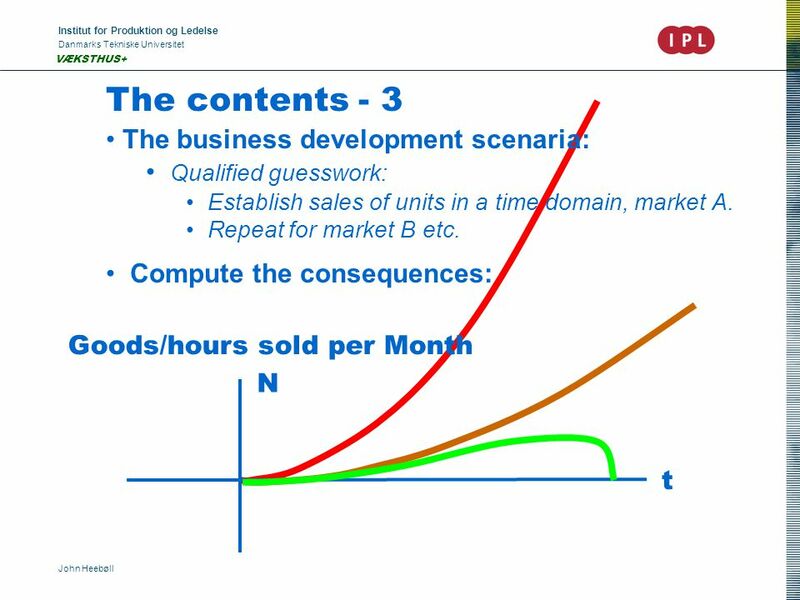 Institut for Produktion og Ledelse Danmarks Tekniske Universitet John Heebøll Greenhouse+ Market Economy AGENDA Michael Porters Market Model The value. 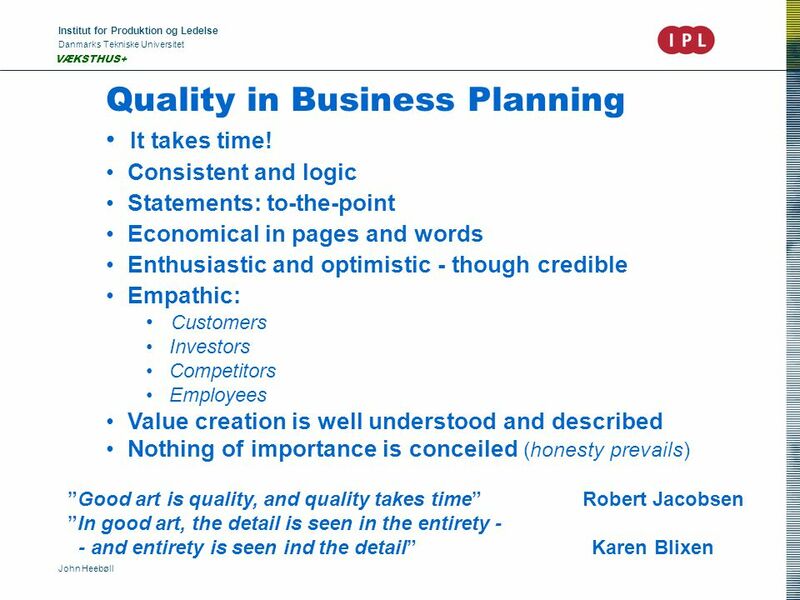 1 Practical Advice on how to write a business plan Dr. Thomas Kunz.